ANTEPRIMA × BADEFEE Brand 's first bath creamer will launch! : Happy Aging & Beautiful Anti Aging loving. 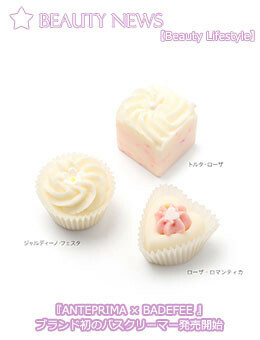 ANTEPRIMA × BADEFEE Brand 's first bath creamer will launch, Iconic motif , shaped like a Fiori ( flower ) all are handmade. Lovely two types , such as the box real cakes! Gift , and also recommended as a reward to yourself.
" BADEFEE " with the meaning of " Bathing of fairy " was born in Germany in 2009. More than 140 items of products deployed in about 30 countries , is a brand that is loved by many people.